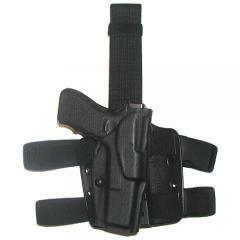 Safariland 6354 ALS Tactical Thigh Holster FREE SHIPPING! The Model 6354 ALS Tactical Thigh Holster from SafariLand delivers the tough, secure and reliable weapon carry you have been searching for. Its rugged SafariLaminate body is injection molded to deliver a form fitting shape the hugs the contours, curves and shape of the pistol it holds. Once holstered, the automatic locking system instantly engages to secure the pistol in place with enough strength to meet and exceed Level I Retention Pull Test Standards. The holster is strategically located on the thigh, where it can be easily drawn from virtually any position or even while running. It is secured with fully adjustable horizontal and vertical straps to ensure perfect placement and fit. A quick release buckle adds to the holster's tactical functionality, allowing users to quickly detach the entire rig at a moment's notice. The holster works great, better than I expected. ©2002-2019 CopsPlus.com: Safariland 6354 ALS Tactical Thigh Holster FREE SHIPPING!